Medical Treatment Decisions and the Law covers an increasingly important area of law, seeking to place medical decision-making in its context and to provide practical guidance to the solution of many problems likely to be encountered in practice. 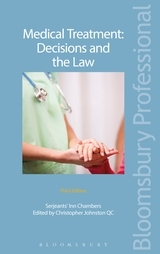 It concentrates on the decisions involved in obtaining authority for the provision, the withholding and withdrawal of physical medical treatment and care and the legal requirements and consequences of the decision-making process. The position where treatment has been refused by the patient (including force feeding and gynaecological treatment).